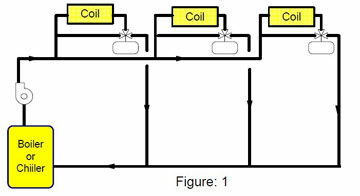 The Figure below shows a converted constant flow system to variable flow by frequency inverter. The valves are 3 - way converted to 2-way (if possible). 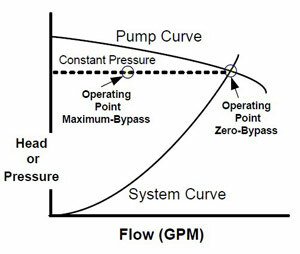 A differential pressure sensor (DP) is located at the end of distribution system to ensure minimum flow. In more complex piping systems, it may be necessary to have more than one differential pressure sensor. The location of this sensor is important as it allows the frequency inverter controller to reduce the frequency inverter speed as flow is reduced. Placing it too close near the pump will lead to a reduction in the energy savings. If it is located at the wrong spot (ie: at the pump), the tendency will be to have a higher setpoint at the frequency inverter controller to assure that there will be enough pressure at the farthest load during maximum load conditions. This higher than necessary setpoint can greatly reduce any potential energy savings. 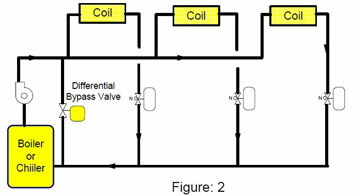 The pressure sensor, in simple piping systems, may be directly connected to the frequency inverters internal controller. The DDC controller in the diagram is shown as an option. The addition of an optional DDC controller allows for control and monitoring of the equipment.